When your grout becomes dirty and unsightly, there are safe ways to achieve a deep clean. At The Grout Medic, we use vapor technology equipment that has become increasingly popular with residential and commercial property owners looking for eco-friendly solutions. Not only is vapor steam cleaning an environmentally-friendly option, but it’s also one of the best ways to get the dirt and grime out of your grout. This process does not require chemicals. In fact, in most cases, plain water is all that is needed to restore your tile surfaces to like-new condition. Here’s more info about what vapor cleaning is and how it works. Chemical Free: Doesn’t need chemicals to get out tough dirt. It is faster and more effective than the chemicals you can buy at the store. 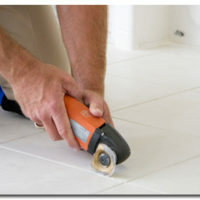 Efficient: It makes cleaning grout very simple. No job is impossible with vapor steaming. Results: The better results are often enough to convince customers to go with vapor steam cleaning. Conservation: It only takes minutes to prepare the vapor and start using it, compared to having to rinse and wash mops and cloths, or apply chemicals that require set-in times. No More Allergens: Sanitizes your property by reducing and eliminating allergens. Removes Asthma Triggers: Since there are no chemicals being used, it doesn’t initiate allergies, asthma or chemical reactions. Anyone looking for a deep clean for their tile surfaces should definitely choose tile and grout cleaning services that utilize vapor steaming technology. You’ll find that vapor offers stellar results that are unmatched by traditional methods, especially when applied by a professional with a lot of experience handling the equipment. Contact The Grout Medic today to learn more about our vapor cleaning technology and to schedule an appointment. Call 1-866-994-7688 or visit our locations page to find the branch closest to you.